The ALA Nano Kit is perfect for getting started with planted aquariums thanks to the small size and cost. Unlike most aquariums, they don’t require a stand. They also don’t have external equipment. Everything is contained in and on the glass. This makes them perfect for a desk, counter, or shelf. It’s a simple, seamless introductory kit that works and looks great. Forget about having to research different parts. There's no need to make sure they work in sync. We’ve eliminated the guesswork by carefully selecting compatible components. Components include a filter, light, heater, thermometer, magnet cleaner, and soil. 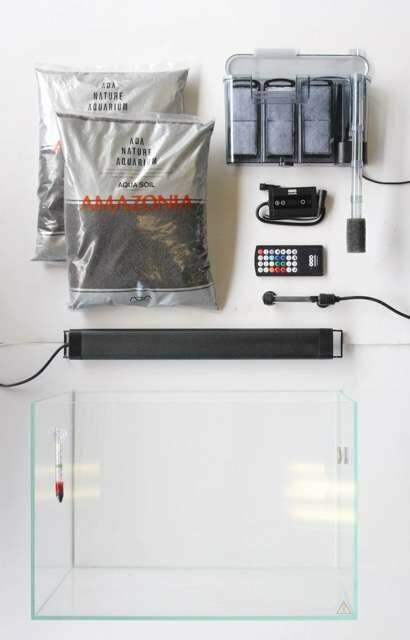 This is everything you need to start a fully-functioning, freshwater aquascape. All you have to do is add water! Really, it’s that easy. 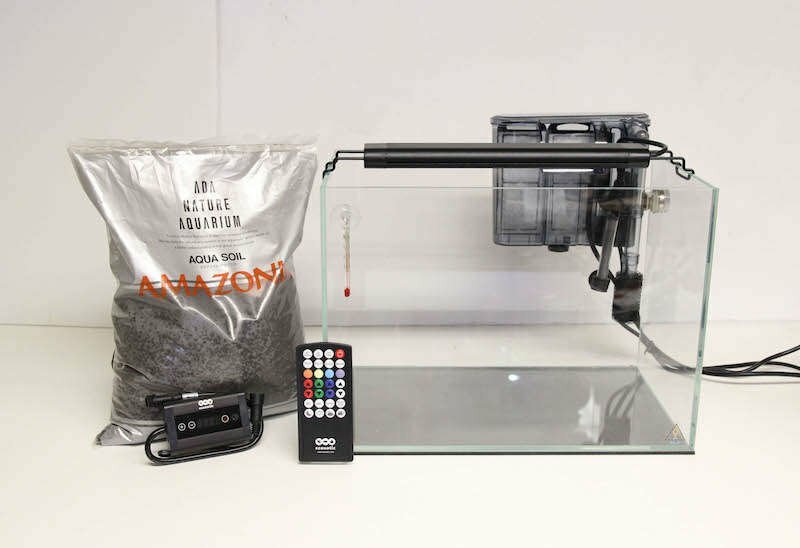 The ALA Aquacosm rimless low-iron glass aquarium lies at the heart of this kit. It provides a perfect aquatic enclosure with exceptional transparency for maximum vibrance. The filter is designed to be discreet with a slim profile and clear housing. The heater is small enough to install inside the filter housing, if you prefer. There’s even an integrated cable routing system to eliminate clutter. This user-friendly system makes it easy to keep the space around your aquarium looking tidy. The aquarium nano kit is very good for a wide variety of freshwater environments. But, it's particularly great for a shrimp habitat. The tanks are just the right size. Plus, the filter comes with an intake foam screen that prevents newborn shrimp from getting sucked up. Not only that, ADA Aquasoil buffers the water by regulating the pH at a slightly acidic 6.8, perfect for thriving shrimp.